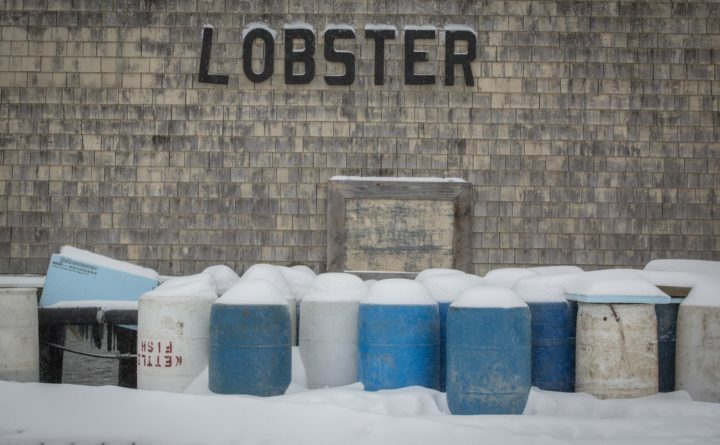 Snow drapes its self picturesquely over bait barrels on a Portland wharf on Sunday. Good morning. Temperatures will peak in the low teens (brrrrr…) with high winds adding to the chill and a chance for snow throughout the state. –After former Gov. 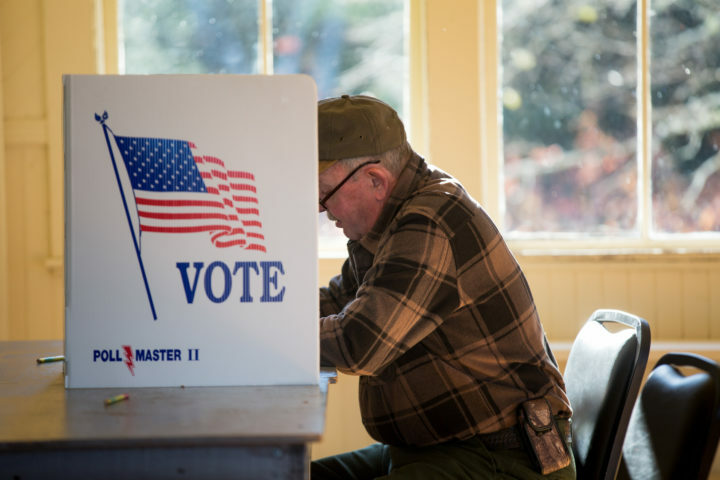 Paul LePage’s laser-like focus on lowering income taxes, Democrats who have gained much greater sway at the State House want to shift the focus to property taxes, which have become a growing burden for households with fixed or lower incomes. Legislators have submitted more than 50 bills designed to provide some form of property tax relief, but the new governor’s vow not to raise taxes and demand for state revenue to fulfill other campaign promises complicate the push to provide meaningful property tax relief. –Stores and cultivation facilities would be able to open in an area just south of Interstate 395. Under the change, the presence of the interstate highway could substitute for the required 1,000-foot buffer between marijuana facilities and schools and parks. 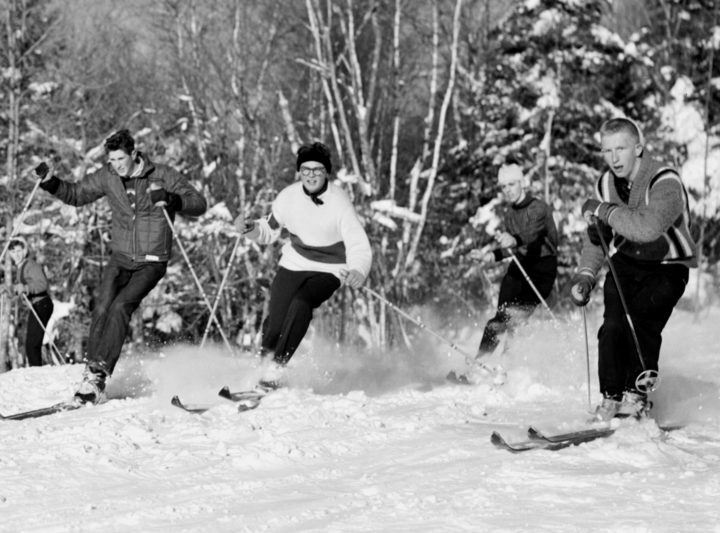 The Bangor High School ski team is shown in action at Bald Mountain in this Jan. 24, 1960, file photo. –There’s only one place around Bangor these days to try your hand at downhill skiing: Hermon Mountain. As recently as 40 years ago, however, there were at least 12 known ski mountains and hills in the Bangor area of varying size and popularity. The BDN’s Emily Burnham describes a few of them and the history that led to their demise. –The troubled Bangor Mall, whose fate has been sinking since its former owners defaulted on a $10 million loan in October 2017, has been listed for sale by Ten-X, the same auctioneering website that auctioned off the former Macy’s location in the mall. The auction, for 531,032 square feet of rentable space, will be held Feb. 25-27 at noon online, according to the Ten-X website that auctioned off the former Macy’s location in the mall. –But delays on the part of the state and federal governments are delaying Bay Ferries’ lease with the town of Bar Harbor to operate its Maine-to-Nova Scotia service off of Mount Desert Island. The ferry company has to negotiate its costs with U.S. Customs and Border Protection, and the town of Bar Harbor has to complete a sale of the ferry terminal property. With the federal government shut down, the CBP negotiations can’t happen, and the state’s property sale has been delayed. –One in two jobs in Maine is in hospitality, but hotels are finding it increasingly difficult to find staff because visa workers, which make up 10 percent of the workforce in high tourist season, cannot find lodging in the expensive apartment markets statewide. High housing prices, plus curbs placed on non-immigrant H-2B and J-1 visas by the federal government, are hampering the ability of hotels in Maine to expand. 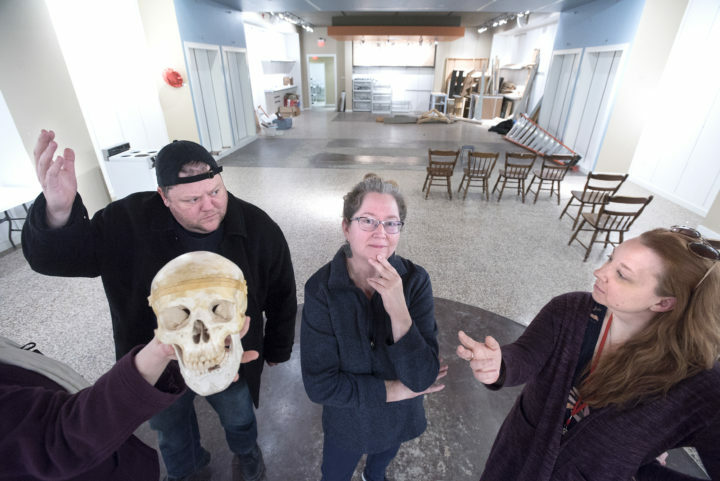 Ben Layman, Julie Lisnet, center and Jennifer Snow pose in the Ten Bucks Theater Co.'s new performance space in the Bangor Mall.